As Hurricane Harvey bore down on Texas this weekend, police in Bay City, an hour south of Houston, drove through the streets with bullhorns and told people to leave their homes. The Colorado River, which cut through the city, was expected to overflow its banks from the storm’s torrential rain. The mayor predicted 10 feet of water. If the bad weather comes and you’re still here, law enforcement voices blared, we’re not going to do anything for you. As Houston began to be pummeled, some in Bay City packed clothes. Others got cats and dogs. Most brought almost nothing at all. There was no time to think. Before they knew it, they were packed on buses headed north, 50 miles to Rosenberg, just outside Houston’s sprawl. In Rosenberg, as in many places with dry land, several schools had been transformed into shelters. By Wednesday, after the hurricane had moved on, leaving 30 deaths and catastrophic flooding in its wake, patience in the shelters was thinning. At B.F. Terry High School, where hundreds were packed inside a cafeteria and gym, kids were crying, porridge was pushed around in bowls, and one man played gin rummy alone. But behind the boredom was something worse: the uncertainty of what awaited them at home. Almost none from Bay City had flood insurance, or knew whether their houses had flooded, or how much. 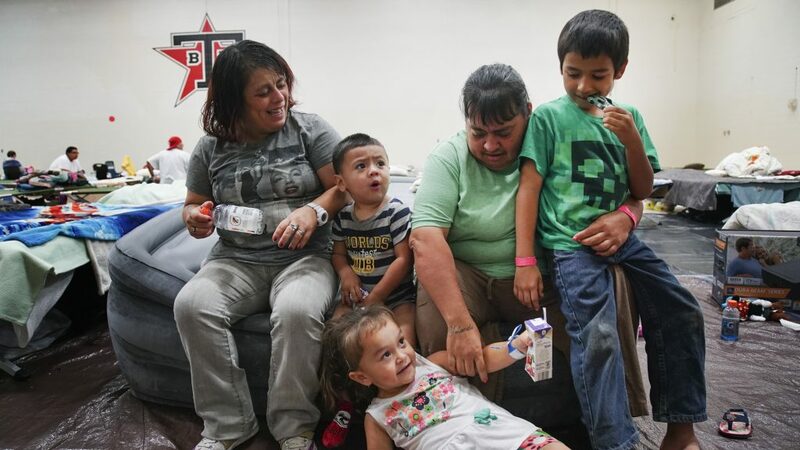 Tanya Hernandez sat in the school gym on a blow-up bed beside her three-year-old daughter and a collection of other children and adults. These were her extended family; there were seven or eight of them, right now, she wasn’t sure. They all lived together in a three-bedroom house in Bay City. As she sat, Hernandez thought about how she had almost bought flood insurance, but then didn’t, because it was too expensive after her father had died, and the funeral bills all came. A lot had led up to the decision not to get insurance. First, her mother had been killed in a drive-by shooting. Then, her father, sick with grief, had taken his own life, and there was so much to pay. There were no cartoons for the kids, just one TV screen that looped images of the flooding, and the gymnasium felt nothing like home. In the high school there were heaps of donated clothes and toys and blankets and books. There was unlimited food and drinks. But there were no cartoons for the kids, just one TV screen that looped images of the flooding, and the gymnasium felt nothing like home. Also, there were cops walking around, which terrified Yolanda ever since her grandfather died and the police took him away. But at least they had stuck together, Hernandez said. The whole family. They’d come together on the bus. They slept in the gym on adjoining cots and blow-up beds. And they also would leave together, on the bus or in a friend’s truck, whichever arrived first. Behind B.F. Terry’s gym was a second school-turned-shelter, George Junior High, where hundreds more of the Bay City residents had gone. George was for the people who had come with pets. On Wednesday, the school’s football team locker room was packed with people, dogs, cats, crates and food, and, until the day before, a bearded dragon and two rats. Conacher was stressed Wednesday because Modesta Humbhreys, who was 71, and had likely lost her house and her car, was allowing people to hold her two-week-old puppies with dirty hands. Conacher worried they could get parvo, or canine parvovirus, a viral illness that was rampant in dogs in Texas, and die. But Humbhreys, who had come from Matagorda, TX, via Bay City, on the same convoy of buses, was worrying about a different dog — the one she had left behind. Humbhreys began to cry. Her house, a trailer she’d lived in for some 20 years, was flooded; she had also heard that her car, which she’d left behind in Bay City, was filled with water. At least her niece had rescued her dog from her trailer. And now, the dog whisperer was safely tucking her puppies into a crate to sleep. Not just Humbhreys had made friends. Many at George Junior High had exchanged numbers, promised to write Christmas cards. They played with each other’s dogs, got each other food. Yet they also wanted desperately to go home, and couldn’t, because though the storm had gone, there was talk of the nearby Brazos River cresting, which would cause more flooding. Knope was tired too; she had already tried to open another shelter that week, in Houston’s Chinatown, but the water had risen and she herself had to get rescued by the National Guard. This shelter was far calmer, and, as the days passed, things were getting easier. That afternoon, the dog whisperer taught someone’s bull mastiff puppy to use a leash. Humbhreys had a friend come visit, and the two sat and talked beside her sleeping puppies. Kids played in the basketball court outside. And in the parking lot, Hernandez and her family were picked up by a friend in a pickup truck. To those remaining, Knope made a promise.